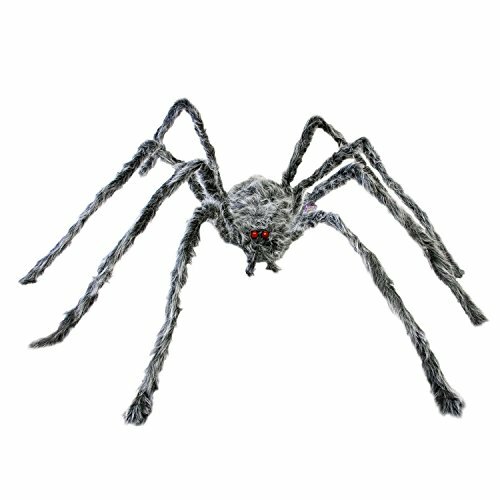 Weave a web of Halloween fun when you decorate with this oversized grey and black spider. This huge hairy spider is a menacing critter to include in any frightful plot or haunted scene! Realistic and easy to place or hang anywhere, this spider is an authentic looking threat. A ready to use accessory that will make anyone scream and run with fright! Add some fright to your night with this realistic creepy crawly 6 foot spider. Perfect for haunted houses, halloween parties or just as a prank! Plush grey and black fury haired huge creepy spider. Has scary red eyes. Legs can be bent into any position. Perfect for placing in a webb or hanging it from the ceiling, in plants, on the front porch or almost anywhere. Dimensions: 6 square feet with legs fully extended. Eight 30" long furry posable legs. Body is 15" long x 8" wide x 5" high.